Abstract: The Nexplanon® implant is a commonly used radiopaque contraceptive device that contains progestogen associated with an ethylene vinyl-acetate copolymer resulting in a slow release of the active hormonal ingredient. It is inserted into the subdermal connective tissue and provides contraceptive efficacy for up to 3 years. Device removal for clinical, personal or device “end-of-life span” reasons is straightforward. In rare cases, implant migration can occur locally within centimeters of the insertion site. Distant device embolization is extremely rare and can result in complications including chest pain, dyspnoea, pneumothorax and thrombosis or prevent conception until the active ingredient is depleted. We present one such case, where a Nexplanon® implant embolized into the pulmonary artery of a young female patient. 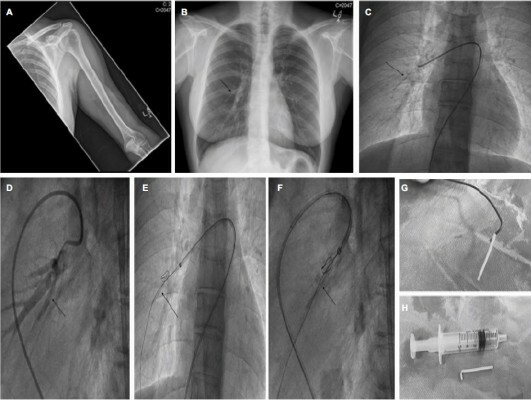 We describe the initial “missed” diagnosis of embolized device on a chest radiograph and subsequent successful percutaneous removal once distant embolization was diagnosed.